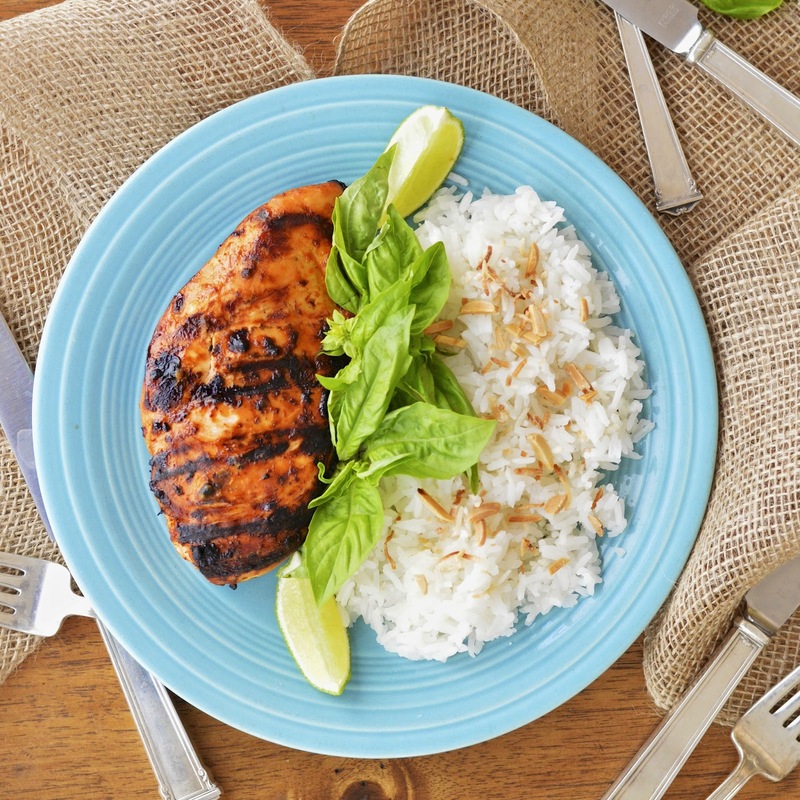 Grilled Thai Chicken with Coconut Jasmine Rice is an easy yet daring dinner that challenges your everyday chicken. Meet my new best friend – coconut milk. Darn this stuff is versatile. You can use it in sweet and savory dishes and it lends a creamy and decadent texture. It’s dairy and gluten free and can obviously be used in vegan dishes, replacing cow’s milk. However be careful, because coconut milk is high in calories and saturated fats. A good solution is picking up the light coconut milk at your store that cuts calories and fat by two thirds. Overall, it’s just a great alternative, calories and all, for my dairy free diet. Back to this wonderful Thai Chicken dish; there are nuances of coconut in the marinade and rice, along with other savory ingredients like hoisin sauce and Sambal Oelek. Sambal oelek is like Sriracha’s big sister. It’s an intensely flavored chili paste that adds heat and flavor that packs a punch. 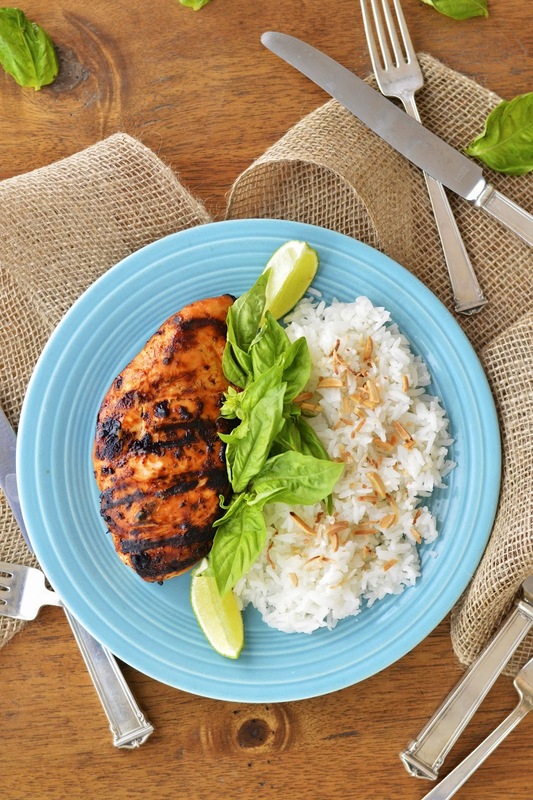 The subtle sweetness of the rice is a great accompaniment for this savory and perfectly grilled chicken. 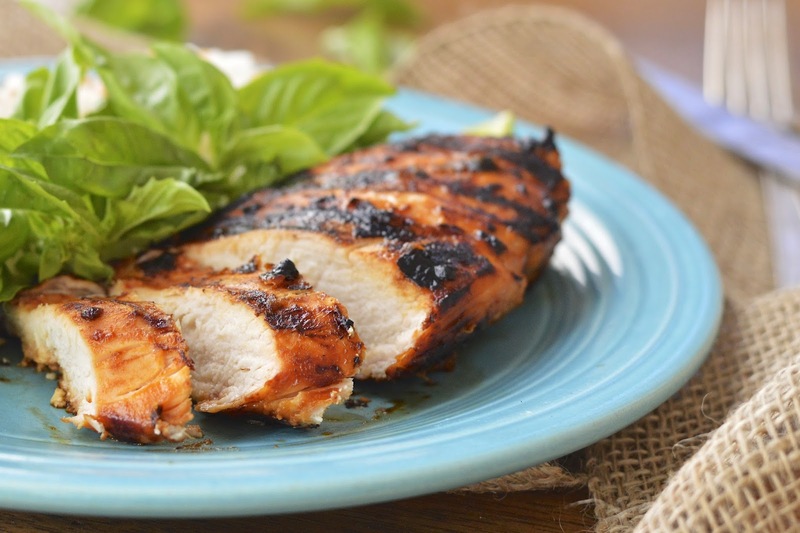 Now that it’s summer, and your grill is all warmed up, cook up some of this delicious chicken. It’s incredibly simple as long as you set aside time for marinating. The longer you marinate the better! The array of flavors will knock your socks off. In a medium bowl mix all of the marinade ingredients together. Place the chicken breasts in a gallon sized Ziploc bag and pour in the marinade. Press all the air out and seal bag. Place in refrigerator for 2 to 4 hours or overnight for optimal flavor. Place rice, water, coconut milk and 1/2 teaspoon of Kosher salt in a medium saucepan. Bring to a boil over high heat, stir rice and reduce heat to lowest setting. Cover pan and cook for approximately 15 minutes, until the liquid has been absorbed. Let sit for 5 to 10 minutes. Preheat grill to 400 degrees F. Remove chicken from the bag and discard marinade. Place the chicken smooth side down on the grill and cook for 12 to 15 minutes, turning once. Remove the chicken from the grill. 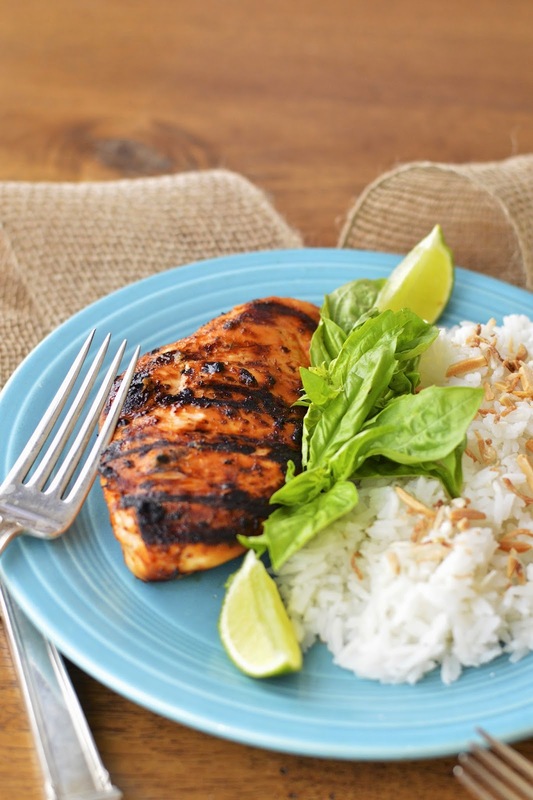 Fluff the coconut rice with a fork and serve with chicken. Garnish the rice with toasted coconut and almonds and the chicken with basil. Serve with lime wedges.